Caption slip reads: "Photographer: Mercurio. Date: 1952-03-12. Reporter: Ostler Assignment: Arroyo Seco Bridge, Pasadena. 11: Const. Supt. Paul Paulson explains bridge construction to June Woodard. Construction Superintendent Paul Paulson discusses bridge project with Shirley Mackey and June Woodard. 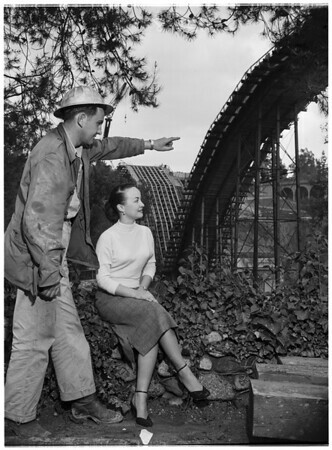 For San Gabriel Pictorial: 13: June Woodard and Shirley Mackey view Arroyo Seco Bridge from underside of bridge looking east. 200: New bridge under construction taken from underneath side of present Colorado Bridge looking north and west. 201: View of Arroyo Seco Bridge from west side of Colorado Avenue at Linda Vista Avenue. 150-151: Underneath view of new bridge from west looking east. 9-10: Underside on the north looking at bridge construction through trees".